The repair services include disassembly, cleaning, drying, re-impregnation of rotor windings and mechanical reconditioning of roller and plain bearings. 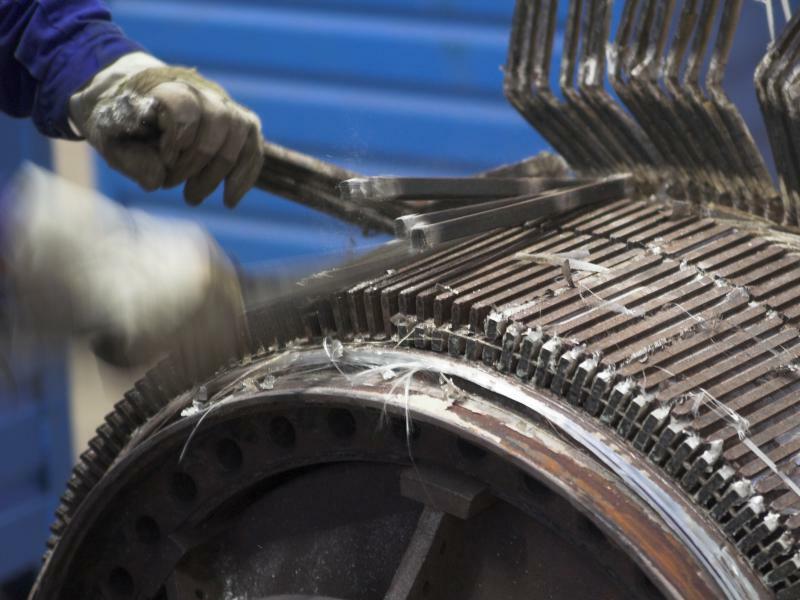 The repair services include disassembly, cleaning, drying, re-impregnation of rotor windings and mechanical reconditioning of roller and plain bearings. Mechanical reconditioning includes application of bearing seats, fi ttings, renovation of fans, junction boxes, cables, installation of laminated cores, rotor bars, welding, replacement of tie rods and much more. In addition, we offer our customers a rotor-balancing service. We can balance all rotors from approximately 10 kg to 32 t at their nominal speed (2-12 pole). Machines up to an individual unit weight of 120 t can be reconditioned; the rated voltage can be up to 18 kV. Pyrolysis is used to remove insulating material that binds and isolates the winding of electric machines. Windings are smouldered in a thermal process at approximately 360°C to 400°C in a low oxygen environment in a pyrolysis process with thermal afterburning. The thermally gentle treatment of the laminated core is of particular importance. Therefore, the temperature curve of the oven is gradually increased at set time intervals. 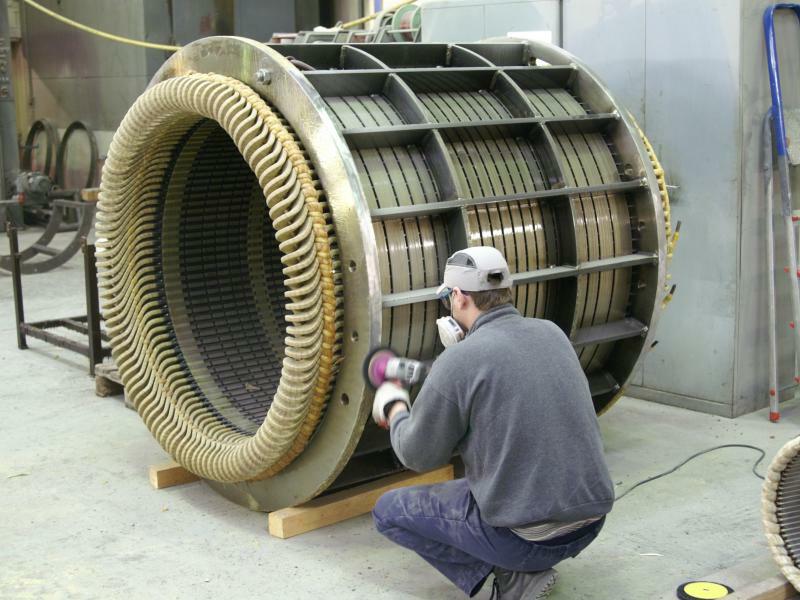 Using this procedure, the stator or rotor is not subjected to thermally induced material stress, thus ensuring the compliance with fit tolerances. The impregnation of windings for electric machines is of particular importance for their electrical and mechanical strength. There exists a variety of impregnation methods used. One of the primarily used processes is called vacuum pressure impregnation. This form of impregnation is very equipment intensive and thus the most cost-intensive process. However, due to the very high quality of the treated parts, customers often request or require the use of this technology. Other impregnation methods include vacuum impregnation, current-UV process and dipping method. Other forms of impregnation have become less relevant these days. Impregnation systems in various sizes and designs allow for the implementation of all mentioned procedures within the PARTZSCH Group. It is important to note that different types of resins are used for the individual impregnation processes. 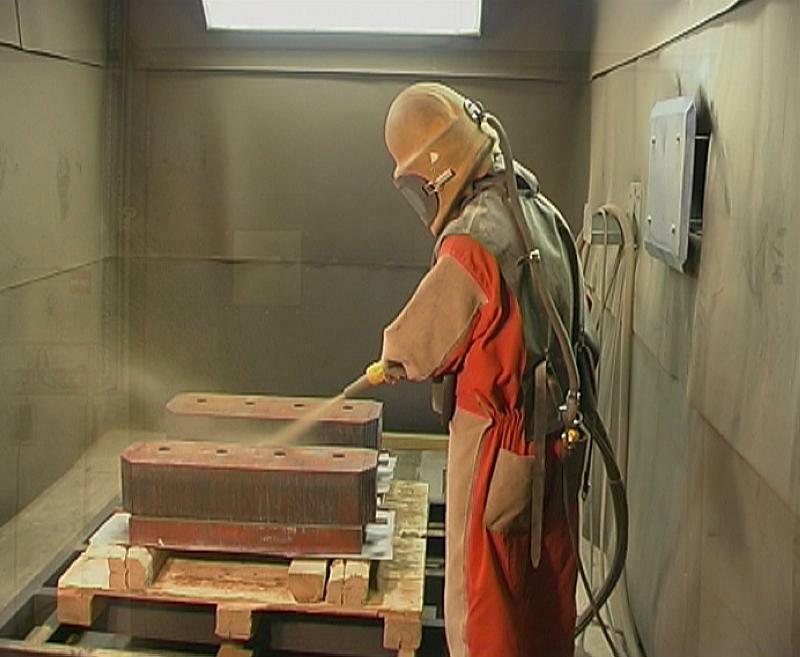 To ensure optimal production results, our experienced staff can help you choose the right process and resin. Using this process, the winding to be impregnated, along with the laminated core and sometimes even the housing, is introduced into the special container of the system. A vacuum of approx. 5 to 10 mbar is generated by a vacuum pump in order to remove air pockets within the winding. During the vacuum impregnation process these small cavities are filled with the inflowing resin. After flooding the winding in the container and a dwell time for the resin to set, normal pressure is restored. At the end of the procedure the flooding process is reversed and the winding allowed to drain. 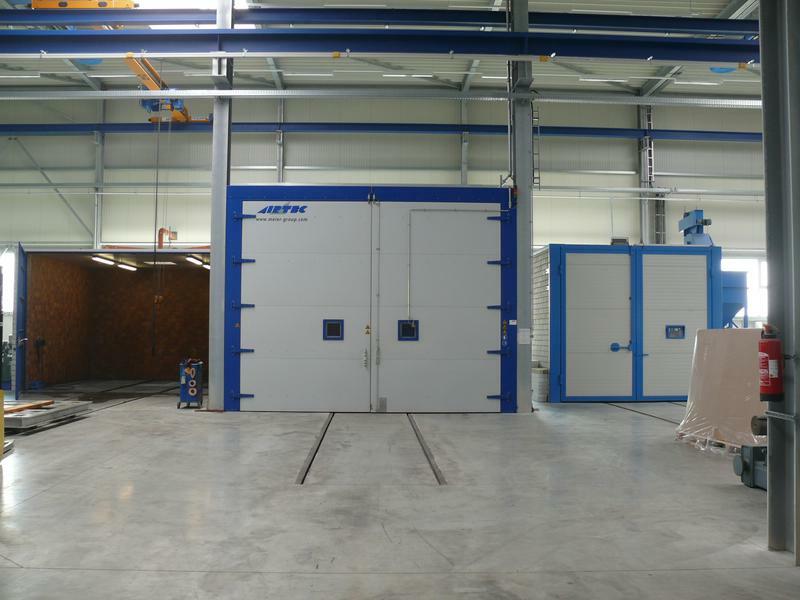 In a drying oven equipped with a rolling device the resin is cured in the winding. By rotating the laminated core, with or without the housing, an optimum distribution of the impregnating agent within and around the winding is ensured. In the vacuum pressure impregnation a special impregnation container with a pressure-proof lid closing mechanism with bayonet lock is used. The entire process consists of two cycles. Similar to the vacuum process, in the vacuum phase the winding is first dried and then flooded with the impregnating agent. During the subsequent pressure phase the impregnating agent is forced into the smallest cavities of the winding through a cushion of compressed air. Using capacitance measurement the resin absorption of the insulation can be monitored. The process is completed as soon as the capacitance change has reached a minimum. The pressure in the container is then used to push the impregnating agent back into the storage containers. After draining, the winding is transferred to the drying oven, where the rolling curing process is performed. The epoxy resin anhydride system corresponds to thermal class F.
Since the epoxy resin does not have a reactive thinner, processing can be performed in a very low vacuum. The air content is thus reduced to a minimum, which is reflected in particular in the loss factor (tanδ). This is of particular significance for insulation systems used with high rated voltages (exceeding 10 kV). Due to the viscosity of the epoxy resin, impregnation is performed at a resin and object temperature of 60 to 70°C. Given the necessity of cooled storage at 10 °C and additional heating costs during impregnation, high energy and equipment costs are incurred when using this impregnating agent. Although epoxy resin offers various qualitative benefits when used as impregnating agent, operating costs should also be considered carefully. Due to its good flow behaviour, this impregnating resin forms the ideal basis for an optimum resin absorption in round-wire windings. Above this, the resin manifests a good penetrating power with low drip loss. With a very short and effective VPI process the complete impregnation is ensured. This low-emission impregnating resin is environmentally friendly and pioneering in terms of elasticity and resistance. Due to its higher viscosity, the impregnating resin must be preheated to a temperature of 40 °C. 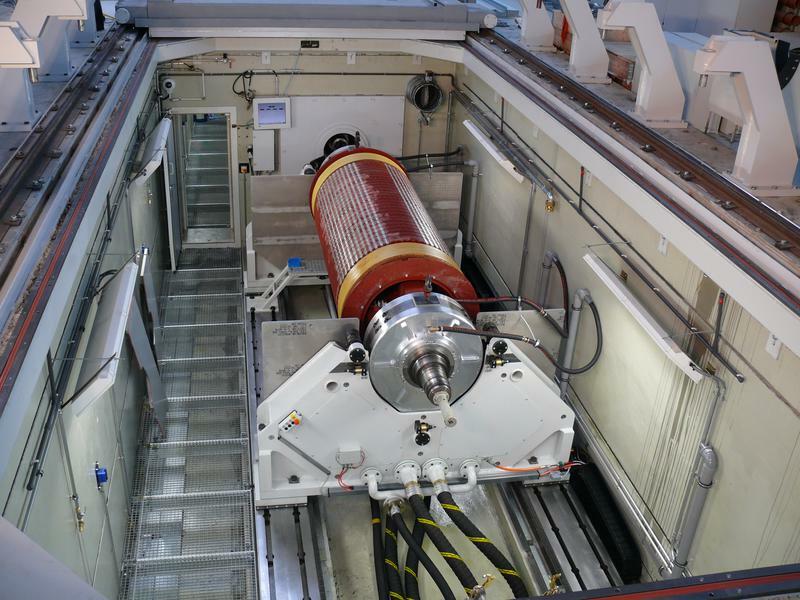 This slightly greater input during vacuum pressure impregnation, however, is reasonable especially for traction motors that are exposed to all kinds of environmental influences, for instance if used as underfloor engines. Large wind turbine generators with a bore diameter of up to 5 metres are impregnated with this polyesterimide resin. With its medium viscosity the impregnating resin is easy to handle and offers a good ratio of resin application and impregnation. This polyesterimide resin is part of the insulation system Samicabond® by Von Roll and meets the requirements of thermal class 180 (H). Both storage and impregnation can be performed at room temperature. To further improve the flow properties of the impregnating agent, the windings are preheated. Thus, even thicker insulation sleeves will be thoroughly impregnated. Due to its comparatively simple handling, this impregnating resin is in great demand. Despite the slightly poorer electrical properties as compared to the epoxy resin system, all electrical characteristics of the applicable standards are met. With this impregnating resin rated voltages up to 13.8 kV can be reliably handled. Current-UV impregnation is an innovative dipping process for low-voltage round-wire windings. In this process a low DC voltage is applied to the winding. The current flow effectively generates the required process heat. Upon submerging the preheated winding, the viscosity of the impregnating agent decreases. The agent can now penetrate into the smallest cavities. With continuous heating the impregnating resin forms a gel at the hot conductors of the winding. After the submersion the resin can drain off at the cooler laminated core. Compared to vacuum impregnation, a higher filling level is achieved in this process.